I recently read Hag-Seed by Margaret Atwood which is a retelling of Shakespeare's The Tempest. I read it because it was one of my in-person book club choices. Ceri chose it, and she's a teacher who often teaches The Tempest so she was keen to read it. 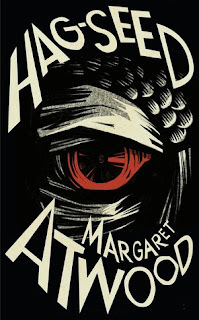 I almost never read Margaret Atwood because I always feel like she's just too high brow for me, even though I really like The Handmaid's Tale. But I was happy to pick this up. I'm not too familiar with The Tempest. I thought I'd done it at school but on reflection that was Twelfth Night! So in The Tempest, Prospero gets ousted by his brother and ends up on an island with his small daughter Miranda for twelve years. On the island is Caliban, a half-human "monster", son of a witch. There's Ariel, the magical fairy, who makes things happen for Prospero, and obviously other things also happen with other characters. In Hag-Seed, Felix is the Director of a prestigious theatre who is about to direct The Tempest, who gets ousted by his underling Tony. Humiliated, he disappears for twelve years, living in a hovel with only the ghost of his own daughter, Miranda, for company. He gets a job teaching prisoners in a local prison, with whom he always puts on Shakespeare. He has some unorthodox teaching methods which have gained the respect of the prisoners and which were really interesting to read. For instance, they're not allowed to swear, but must choose ten of the insults from the play they're doing. Hence the name of the novel, which is taken from an insult thrown at Caliban. After a few years of teaching Felix is told that Tony and Sal, the other person involved in his downfall and who have made their way up the political ladder, are coming to visit the prison. Felix decides he will stage his Tempest finally, and will get his revenge. Apparently there are loads of hidden things in the text for people familiar with the origial, which clearly went way over my head as I'm not. It took me a while to get into, but once I did, I really liked the book. Felix is quite an unreliable narrator and is quite unlikeable at times, making him an interesting lead character. I liked Anne-Marie, the person playing Miranda, and several of the prisoners. I'd have liked to know more about them, really. Generally my book club liked it and we talked about Shakespeare and modern retellings too. Apparently the film Yentl is supposed to be Tweflth Night retold, so I think I'll have to watch that soon. Also, did you know Shakespeare made up the name Miranda for The Tempest? In all, it's a good novel, although a little thin on actual plot I think. Still, seven out of ten!